Waiting on Wednesday is a meme created by Jill at Breaking the Spine, where we discuss an upcoming book that we're crazy excited for, and literally CANNOT wait to read. Ever since I saw this book on someone's blog (though I can't remember whose) I've been obsessed with this book! It's the absolute perfect fairy tale retelling. I've always found Sleeping Beauty's story a little boring. And fast. So yeah, she pricks a thorn, wakes up, and gets married. Good for her; I'd love a life like that. But this novel takes things to a whole new level, and it seems like it will make Aurora's story so much more interesting. I actually, for once, am really excited for the fact that the boring prince probably isn't going to end up as the male lead in the book. I would have preferred the prince to be the lead but be snarky and badass and all, but I suppose a handsome rebel is just as good. And the fact that Aurora is fighting her destiny and wants more freedom? Yessss! The actual Aurora from the Disney version is kind, sure, but I always thought she was kind of stupid for singing that "Once Upon A Dream" song with the prince. Like, no, that's stupid. Please don't. And this is coming from the biggest fan of Disney Princesses ever, so yeah, that's a problem. But this novel just makes me want to read the story so bad, and I have complete trust that Rhiannon will deliver exactly what's expected. 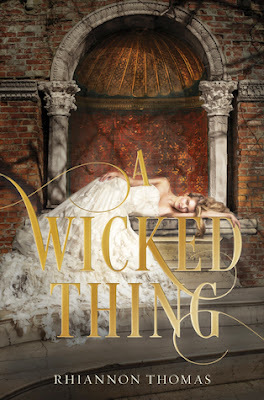 One of the reasons I trust the author so much is probably because of her choice of such a gorgeous cover. I mean, look at that thing! It just makes me want to read the book that much earlier! I'm the kind of person who always judges a book by its cover, so to this book, I say "heck yeah!" There are many sequels I've been this excited for, but I don't believe I've ever been this stoked for the first book in the series, especially not a retelling. I just hope that this book lives up to my pretty high expectations. Book Synopsis: A spinning wheel. A prick of a finger. A terrible curse. One hundred years after falling asleep, Princess Aurora wakes up to the kiss of a handsome prince and a broken kingdom that has been dreaming of her return. All the books say that she should be living happily ever after. But as Aurora understands all too well, the truth is nothing like the fairytale. Her family is long dead. Her “true love” is a kind stranger. And her whole life has been planned out by political foes while she slept. Everyone expects Aurora to marry her betrothed and restore magic and peace to the kingdom before revolution tears it apart. But after a lifetime spent locked in a tower for her own safety, Aurora longs for the freedom to make her own choices. When she meets a handsome rebel, he tempts her to abandon everything for a different kind of life. As Aurora struggles to make sense of her new world, she begins to fear that the curse has left its mark on her, a fiery and dangerous thing that might be as wicked as the witch who once ensnared her. With her wedding day drawing near, Aurora must make the ultimate decision on how to save her kingdom: marry the prince or run.